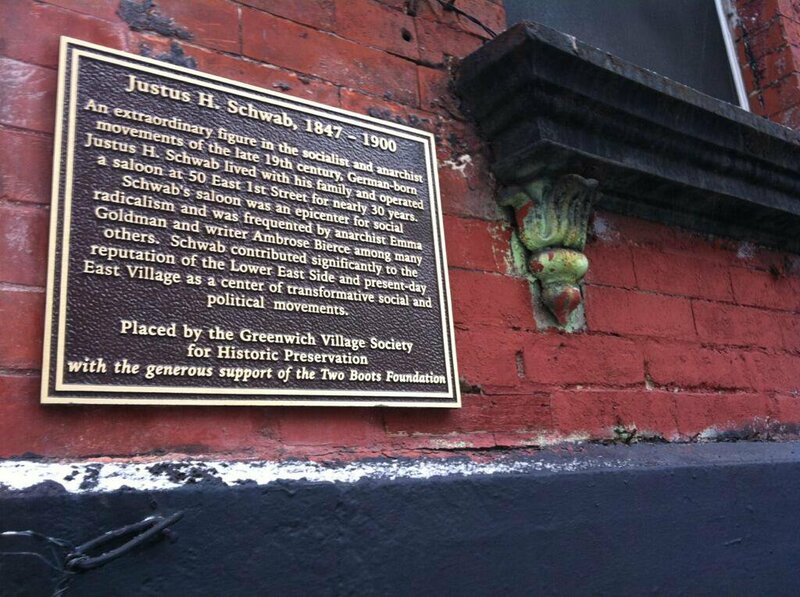 “On Saturdays when I did not have to lecture, we used to visit the saloon of Justus Schwab, the most famous radical center in New York. Schwab was the traditional Teuton in appearance, over six feet tall, broad-chested, and strait as a tree. On his wide shoulders and strong neck rested a magnificent head, framed in curly red hair and beard. His eyes were full of fire and intensity. But it was his voice, deep and tender, that was his peculiar characteristic. It would have made him famous if he had chosen an operatic career. Justus was too much the rebel and the dreamer, however, to care about such things. The rear room of his little place on First Street was a Mecca for French Communards, Spanish and Italian refugees, Russian politicals, and German socialists and anarchists who had escaped the iron heel of Bismarck. Everyone gathered at Justus's. Justus, as we affectionately called him,was the comrade, adviser, and friend of all. The circle was interspersed with many Americans, among them writers and artists. John Swinton, Ambrose Bierce, James Huneker, Sadakichi Hartmann, and other literati loved to listen to Justus's golden voice, drink his delicious beer and wine, and argue world-problems far into the night.” Emma Goldman, Living My Life. Justus Schwab was born in Frankfurt-am- Main in Germany in 1847. His father took part in the 1848 revolution and for this served four years imprisonment for rioting against the Prussian military. His father allegedly ran a tavern, according to the rather unreliable New York Times. He apparently inherited a small fortune from his father. He learnt the trade of mason and may have been active in the labour movement in the late 1860s. He immigrated to New York in May 1869, and may have lost his job during the 1873 depression. He joined the German section of the IWMA in New York. With unemployment reaching high figures workers demanded public assistance from the municipal authorities. A large meeting in Tompkins Square was broken up by police in January 1874. When Schwab and other German workers resisted they were clubbed by the cops. The square was cleared but Schwab marched back holding a red flag and started singing the Marseillaise. He was then arrested and charged with incitement to riot and waving a red flag. The breaking up of the meeting ended the unemployed agitation, however. He married shortly after the incident and by 1880 had two children. Justus now opened a saloon on 50 First Street, which became a centre for radicals. He was targeted by the temperance movement as well as by the police. Refusing like so many saloon keepers to bribe the police with drinks his saloon was often raided. He was arrested in June 1876 for selling beer on a Sunday, but was acquitted. He became chair of the Committee of Arrangements during the great strike of 1877. In April of the same year he appeared in court for disorderly conduct during a meeting but was again released. He was a member of the Socialist Labour Party, but by January 1880 he and Moritz Bachmann became critics of its alliance with the Greenback Party. He began to subscribe to Johann Most’s paper Freiheit, which reinforced his already strong resentment of the reformist direction of the SLP and by the high-handed party leadership. He made several attempts to curb the power of the leadership and the situation came to a head when the SLP voted in favour of a platform with the Greenback Party. He argued for rank and file control of the Party and a decentralisation of power. He was expelled from the Party with 40 others. These, now calling themselves social revolutionaries after Most, started meeting at Schwab’s saloon. They were joined by Wilhelm Hasselmann, like Most a former German Social Democrat MP, and like him, also expelled from the Party. Hasselmann had only arrived in the USA a short time before. He suggested calling the circle the Social-Revolutionary Club. This was inaugurated on 15th November 1880 with 27 members. The Club maintained weekly meetings throughout the 1880s. The club evolved in an increasingly anarchist direction. Schwab played an important part in the October 1881 Chicago Congress of Social Revolutionaries as the delegate of the Social Revolutionary Club of New York. The Congress denounced wage slavery and private property and endorsed the resolutions of the July 1881 Social Revolutionary Congress in London. In 1882 Schwab became interim editor of Freiheit whilst Most was travelling from Europe to the USA. He remained a close associate of Most for years, formally introducing him to the Club at his first appearance before an American audience. However in 1886 he fell out with Most over the scam organised by several anarchists to insure their tenements and then to claim after setting fire to them. Several were arrested and sentenced. This caused a rift in the German movement with Most refusing to denounce the fire-raisers. Schwab, always a morally upright man, refused to back Most and he was then called a coward by him, and his followers now boycotted the saloon. As Schwab wrote to another anarchist Robert Reitzel, “the means must not desecrate the end”. In 1884 Schwab had been one of the anarchists who attempted to disrupt an SLP meeting when its executive Committee passed a motion denouncing anarchists. In the ensuing fray Schwab was arrested for inciting to riot but again was acquitted. Justus contracted tuberculosis in the winter of 1895 and was bed-ridden from then on. He died on December 18th 1900. His funeral procession comprised nearly 2,000 people and was a mass show of respect for this important figure of German-American anarchism. The funeral was attended by many representing opposing factions in the movement, their differences forgotten in their sorrow. Most attended and burst into tears on several occasions. John Swinton , giving the second speech at the funeral said: “I am entirely overcome when I attempt to speak of our dead brother. I have never known a man so self-sacrificing, so faithful, so noble”. Goldman, E. Living My Life.